I've been backpacking for over 30 years, doing solo and group trips, with and without kids. I do day trips, weekenders and week-long or longer trips throughout the year. I backpack in all climates and seasons and in various locations within the USA, to include my favorites being Yosemite and Sierra Nevada, California. I also have worked in Afghanistan for 4 years and rely on my backpacking equipment constantly. I go lighter whenever possible. Quality and reliability of items I carry are paramount to me over price and weight. Tested item: Size 2XL regular, color is Moss Green. Men's sizes available include: Small, Medium, Large, Extra large, and 2XL which are priced at $28.00. The shirt is a relatively lightweight feeling fabric in a short-sleeve, relaxed fit, Henley style, with a three-button collar. 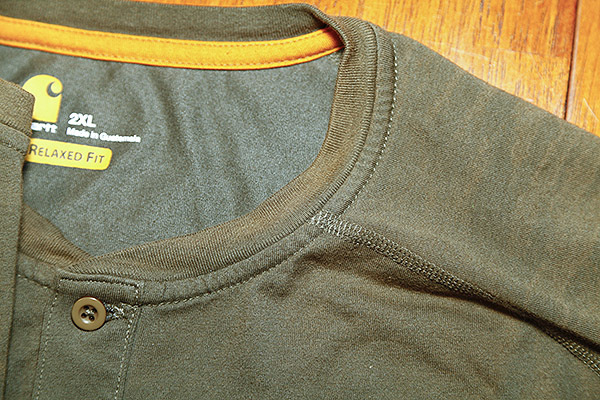 There is a left-chest utility pocket sewn that also displays the Carhartt logo. The material is designed to wick away moisture and the manufacturer claims it has a stain-release "Stain Breaker � Technology" finish which is supposed to help it come clean with every wash. There is a tag-less label printed inside the rear of the collar area to reduce the possibility of chaffing which I like. The shirt appears to be very well made. 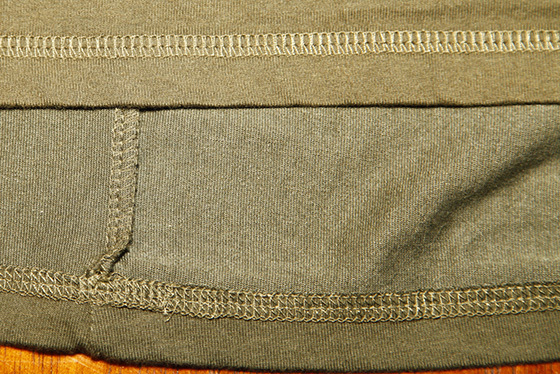 The material is soft to the touch and all seams are flat sewn. I wear a 2XL Regular fit and this shirt fits me very well and is comfortable to wear. I seem to have a good range of motion without any binding in the armpit area. I will certainly test this out later as I plan to wear it during many upcoming outings with different types of activities. The manufacturer's site states clearly that this shirt, "is built for the long haul, not the long jog" and that it, "is made for workers and not athletes." I do not know how this will perform for backpacking, but I will be eager to find out. The website seems easy enough to navigate through. There is also a manufacturer's popup window requesting voluntary survey feedback on the customer's total experience using their site. The survey is conducted by an independent (3rd party) company and I have the opportunity to opt out. It is nice to know the manufacturer cares enough to seek input. I located washing instructions on a sewn tag, which was attached to an inside seam of the shirt. The standard care as listed, is to machine wash in cold water with like colors, non-chlorine bleach when needed and tumble-dry low temperature and no fabric softeners". There is a step-by-step listed return policy on the manufacturer's website which seems quite clear and easy to follow should one find that necessary. Trying on the shirt, I found it to be quite comfortable. The fit is nice and I seem to have a good range of motion without any tightness or pinching. As I mentioned above, it is soft to the touch and I am eager to get started with this test. Well, this is a nice item to get to test. I will be curious to see how a work shirt by design will work for an active lifestyle, which according to the manufacturer, it is not intended for. I am very familiar with the Carhartt name and products, having owned many of their products in the past that have lasted for years of hard living. I have always been impressed by their quality and will report on what I find with this shirt. I wore this shirt during daily activities to include working outside, playing golf, day-hiking, backpacking, running errands, and doing chores around the house. Location #1 - Carmel Highland Golf Course, San Diego County California, USA. Conditions: Groomed grass sloping hills, sunshine and cloudless sky: Temperatures ranged from approximately 75 - over 100 F (24 - 38+ C). Duration - About 4 hours from about 8:30 am to about 12:30 pm. Location #2 - El Capitan Mountain, Eastern San Diego County in Southern California. Conditions: Foot trails and rocky outcroppings. Temperatures ranging from 75 to 90 F (24 to 32 C). Duration: Two day-hikes, each lasting approximately 4-6 hours. Location #3 - Numerous miscellaneous day hikes, normal work days, standard chores, and errands ranging from 2 - 5 miles (3 - 8 km) in the area of Eastern San Diego County. Conditions: Maintained trails, grassy areas, some concrete sidewalks and maintained roadway shoulders. Temperatures ranging from 75 to over 100 F (24 to 38+ C). Duration: Day use only and no overnights. Location #4 - Salton Sea area of California State Parks and Recreation located near Thermal, California. Conditions: Open desert areas (sandy / rocky). Temperatures ranging from 80 to over 110 F (27 to 43+ C). Duration: One trip, 3 days, two nights. My first opportunity to wear this shirt came on a day of playing golf. 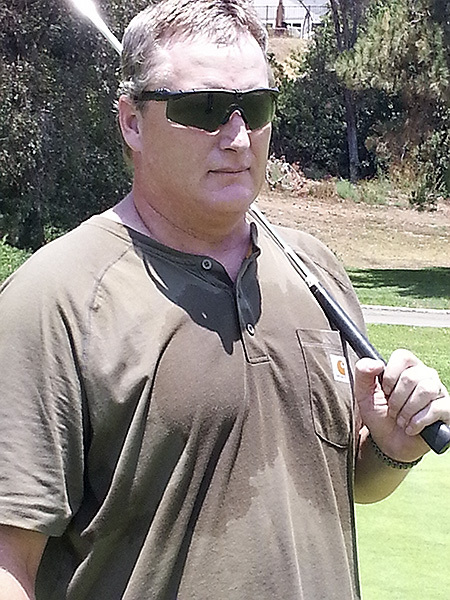 We got a tee-off time and the temperature was over 100 F (38 C) by the time my son and I were done with our 18 holes. I sweat, but not usually to the point where I see it soaking through my clothes. This photo shows what my shirt looked like during the game. While I don't find this wetness very attractive to look at, the shirt remained quite comfortable throughout. My range of motion was unsurpassed by any other shirts I normally wear golfing and I never found myself tugging at my sleeves to pull them up like I often have to with other shirts I own. On this day, I was a victim of a pretty good sunburn. I did not apply any sunscreen...I know; I know. Anyway, my point is that this shirt does not claim any sunscreen protection properties yet the areas where I was covered by the shirt remained completely protected. Washing the shirt the very first time, I followed the instructions to the letter. Cold water with like colors, using no bleach and no fabric softeners and I dried it in the dryer, with the setting of tumble-dry at the lowest temperature setting. I was very disappointed to find numerous yellow or faded areas on the shirt. There were many little faded spots and streaks across the shoulders and upper chest areas of the shirt. The collar also showed the same problem. I have no idea why this would occur and I am confident that it was not due to anything I did. Apparently there is a problem somewhere though as I have not seen this on any other clothing I own or that was washed with this shirt. The fading is something I might expect on a very old piece of clothing, not having only worn and washed it once. I have relegated this shirt to wearing it only away from public (and my wife's) view. I still love how comfortable it is. Wearing the shirt and carrying a pack works together well. The shirt does not rub me where the pack presses. 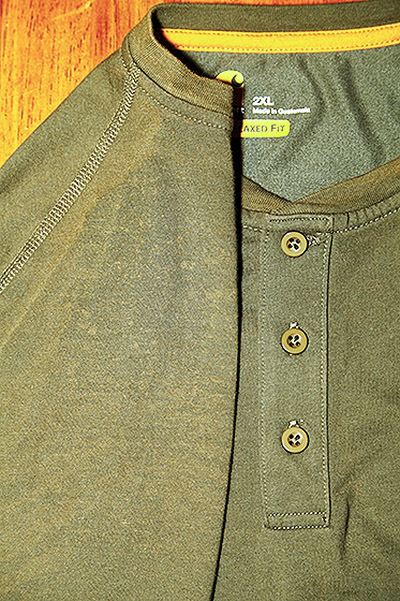 There is still an issue with the moisture appearing on the shirt and not evaporating away very quickly. Under mild exertion and mild perspiration the shirt collects the moisture like a sponge and holds it for a long time, even in southern California where inland humidity is usually pretty low. I have very mixed feelings about this shirt so far. I am really impressed by how comfortable this shirt is, to include my range of motion. I am very disappointed by the absorption of sweat staying and the discoloring this shirt. I can not bring myself to wear this anywhere in public. A lunch break from the job would have me wearing a sweat soaked shirt for everyone to see. Uh - no. I am dually disappointed by the yellowing of the material. There is a definite issue with the type of material dye used as it seems it can not handle even one washing without fading. This to me is unacceptable and is a product I would return immediately under normal circumstances; but alas, the test continues. I did not wear this shirt during this testing period as I sent it in to Carhartt Customer Service. I wrote about that experience below. 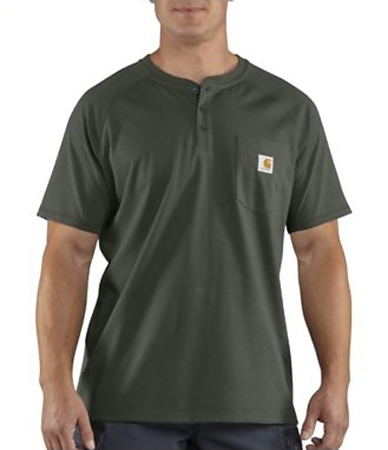 Initially, I was working in a different part of the country when I received instructions on how to return the shirt to Carhartt for their inspection and determination of whether to replace or return this same shirt to me. Upon my return home, I packaged up the shirt and sent in to Carhartt per their instructions. On 30 Sept 2013, I went online to the Carhartt website and contacted their customer service explaining the issues I found with this shirt. On the morning of October 1st (less than one day later) I received an email from Carhartt Customer Service. I have copied and pasted a portion of their email below and marked it in quotation marks. Thank you for informing us of the problem with your shirt. We value your comments and would like to apologize for any inconvenience you have experienced. We are committed to offering the finest products and customer service available. Our goal is to ensure your satisfaction with each purchase and provide you with the best possible service for years to come. � A brief description of the problem." They also provided instructions on how to send the shirt to them. I should also note that I actually received a pre-paid UPS mailing label later this same day. I was unable to send in the shirt right away as I was working on the road in Tennessee at the time of this. I returned the shirt once I got back home in California. This portion of my test report will be short as I had sent in my shirt to the Carhartt Custoimer Service Department. The Long Term Report due date arrived prior to my receipt of my new or returned shirt. I will provide an addendum to this report once I have a shirt to write about and can complete my test report. 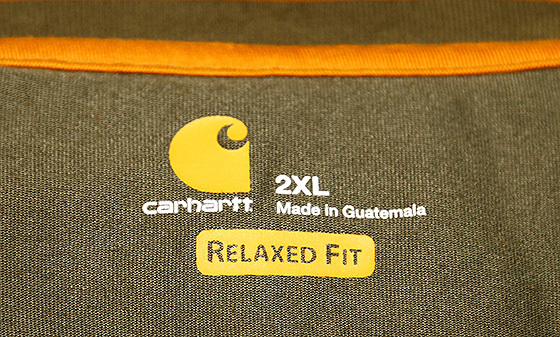 While the shirt remained comfortable to wear, I had to return my shirt to Carhartt. To date, my experience with Customer Service has been positive, but it is not completed as yet. Once I have a shirt to write about, I will provide an addendum to this report. I would like to thank Carhartt and BackpackGearTest.org for the opportunity to participate in testing this product.